What is the MStar C1 Board? The MStar C1 Board is a fully capable Android based media player with an optional Digital TV tuner. The powerful hardware of the MStar C1 Board supports hardware decoding and output of video up to 4k HEVC. The digital TV tuner handles any DVB cable or terrestrial TV signal. For DIY development that requires additional hardware, a Raspberry Pi 2 compatible extension connector was also incorporated . On the outside, we have exposed all of the main chip’s expansion features as industry standard connectors. Internally we strive for compatibility too, as with the RaspberryPi 2 expansion connector. 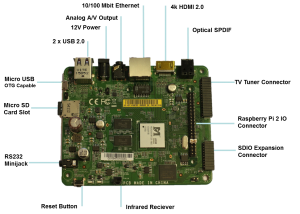 The MStar C1 Board aims for high performance at a very competitive price. We used all the cost-saving tricks in the book to provide you with the best price/performance ratio. Even in its basic form, the MStar C1 Board includes 4GB flash – you don’t have to spend extra to boot your board. Many media players have an underpowered GPU, compared to their main processor. 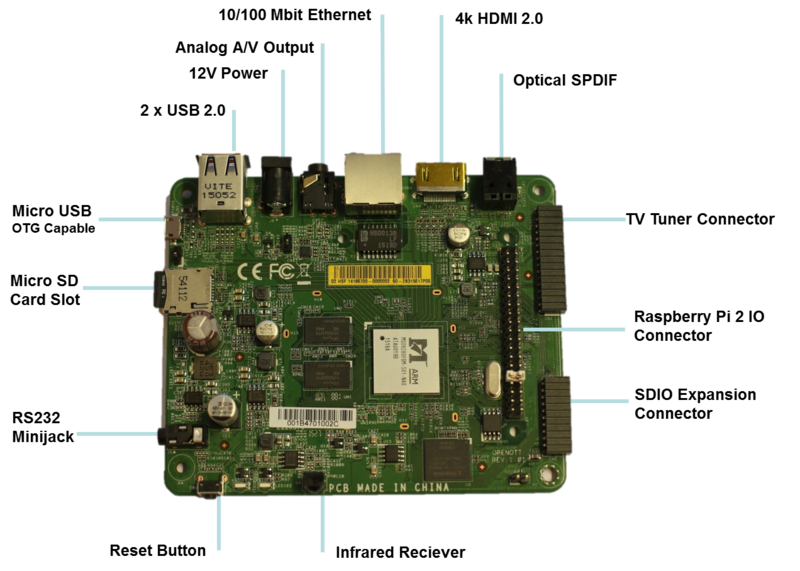 The MStar C1 Board sports a 6 core Mali 450, which matches up nicely with the quad core ARM A7 CPU. If you run out of storage with the included 4 GB Flash, the Micro SD slot is there for up to 128 GB expansion. 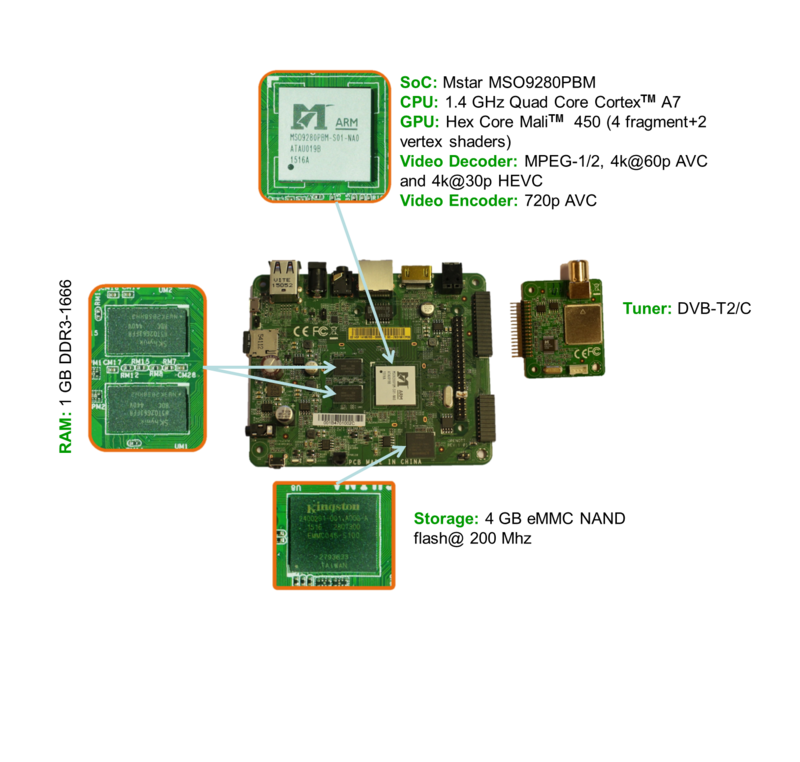 The full product leafleat for the board’s chipset can be downloaded here: mso9280mc_pb_v03 . The MStar C1 Board comes with an example app to control the pins and busses of the RPi I/O connector. Libraries, example code and documentation are also available to help you make your own apps. Multiple apps using the expansions connector can run at the same time, and if you make a project you’d like to share with others you can use any Android distribution method – source, apk files or even publish to the Google Play store. Perhaps your project is so great people will pay to get it? For setup of development environment and getting started guide, please see this page. To update the Android system software on your MStar C1 Board, go to Settings/System Update. Amazon app store – after installing this app you can also install apps via the Amazon store.